The sinking of the Rainbow Warrior : an opera / by Colin Bright and Amanda Stewart. The sinking of the Rainbow Warrior (1994) an opera in one act for 6 singers & 6 musicians Amanda Stewart and Colin Bright 1 hours, 11 mins, 23 sec. Prelude (5'00") -- I. Underworld (11'00") -- II. Interrogation (14'00") -- III. 'Love' Duet (8'00") -- IV. Testimony [In the pacific] (8'00) -- V. La bombe (4'00") -- VI. Vortex (10'00"). Recording of the adaptation of the opera for ABC radio, with the addition of recordings from radio and television archives of the ABC, Radio New Zealand and Sound Archives/Nga Taonga Korero. Performers: The Song Company ; AustralYSIS ; Roland Peelman (conductor) ; Amanda Stewart (chorus) ; Andrew McLennan (announcer). Liner notes include full text of opera, and biographical notes on composer, librettist and performers. Score: The sinking of the Rainbow Warrior : an opera in one act (prelude & 6 scenes) for 6 singers & 6 musicians / music by Colin Bright ; libretto by Amanda Stewart. 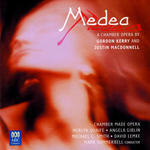 CD: Medea / Gordon Kerry and Justin Macdonnell. CD: Minotaur the island / by Margaret Cameron & David Young. CD: The Minotaur trilogy / by Margaret Cameron & David Young.